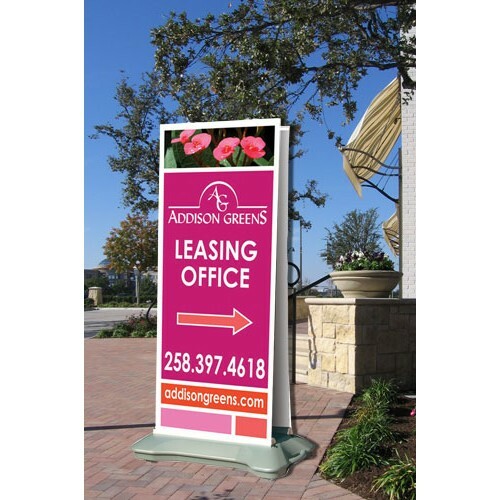 A terrific idea when you want to have a large promotion on the street or outside your office but need to move it in at night. 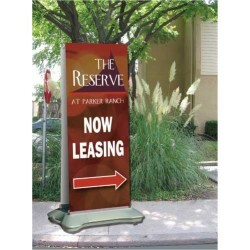 The banners are housed within the base and pulls out when you are ready to display. Simply roll the unit outside, pull out the banners and attach them to the support bar. Fill the base with water or sand to add more stability. You should take down your unit in strong winds or bad weather. The unit can accommodate one or two banners. Height adjusts to three different levels.